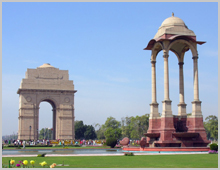 Company representatives will receive you on arrival at the international airport in Delhi late in the evening. Transfer to your hotel. Relax. Overnight at Delhi. Proceed for Agra after breakfast. Reach Agra in the afternoon. Visit Itmadullah's Tomb built by Empress NOOR JEHAN in memory of her father (The interiors of which are considered better than the Taj). Overnight at Agra. Breakfast at hotel. Proceed for excursion to Amber Fort in the outskirts of Jaipur. Elephant ride ascent to the fort. Proceed for sightseeing of the city. Overnight at Jaipur. Start for Udaipur after breakfast. Udaipur is the jewel of MEWAR -a kingdom ruled by the Sisodia dynasty for 1200 Years. Relax in the evening. Overnight at Udaipur. Breakfast at hotel. Proceed for sightseeing tour of Udaipur, stopping first at City Palace. Here you will marvel at rooms with mirrored walls and ivory doors, colored glass windows and inlaid marble balconies and the Peacock Courtyard. Overnight at Udaipur. After breakfast drive to Jodhpur. Relax in the hotel and visit the museum of UMAID BHAWAN PALACE. Overnight at Jodhpur. 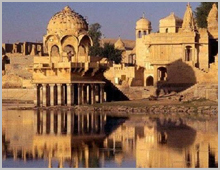 After a relaxed breakfast proceed for full day sightseeing tour of The Golden City - Jaisalmer. It is in the heart of the Great Indian Desert. Its temple, fort and palaces are all built of yellow stone. The city is a mass of intricately carved buildings, facades and elaborate balconies. Visit the JAISALMER FORT - The oldest living Fort in the world. (This is the highlight of the tour) Stay overnight at the SWISS TENT CAMP. Breakfast at hotel. Proceed for sightseeing tour of Bikaner. Reach and check in at hotel. Overnight at Mandawa.